Sustainability is, and will always be, a challenge for musicians who intend to keep pushing their music forward. And as we've learned from the musicians themselves who have committed themselves to their art — day jobs or not — it is certainly not the easiest profession. But as the Internet and (this is debatable) the music industry continue to evolve, the sustainability route has become a shape-shifting canvas — some methods may not work for others, but what's most important is that it works for you. Or, as Lush 99.5fm DJ Elias Soh puts it, "the template is changing quickly and it's quickly emerging that there is no template, only malleable options." Elias Soh will be part of a panel of notable individuals that'll conduct Fireside Pitch, a workshop conceived by *SCAPE and Invasion Singapore to expand on sustainability in music. 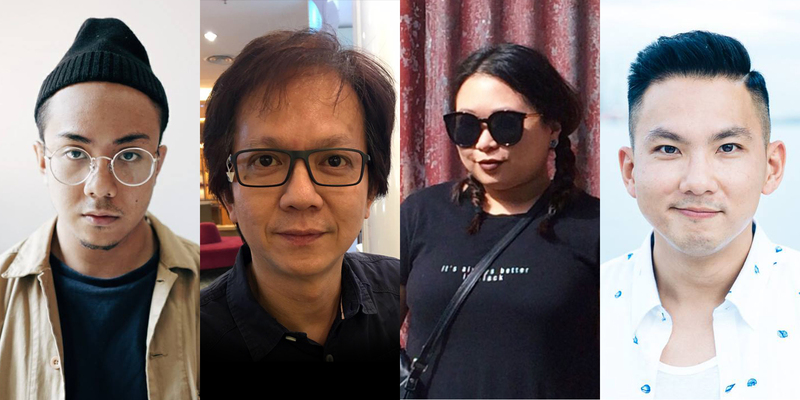 In it, they allow musicians to "pick the brains of some of Singapore’s most respected music industry experts" by getting them to "pitch" themselves to the panel. So before the Pitch is conducted at next weekend's *SCAPE The Invasion — which includes an incredible line-up, mind you — we took the time to pick the brains of three people off the panel ourselves: Elias Soh along with Colin Goh, founder of local independent label Ocean Butterflies Music, Warner Music Singapore's Melina Chua and the Youth Arts Manager of the National Arts Council (also the drummer of King Kong Jane), Wu Jianping. The beautiful thing about music is that it can be applicable to so many different facets of life, and it is really up to the creativity of the musicians to come out with something out of the norm​..."
In your opinion, why do you think it's important for musicians to develop business acumen? Big-picture acuity is key in ensuring that you have at least some awareness of what your journey, whether in the short or long term, is going. Even if you're paying someone else to make decisions for you, being aware means retaining a relative amount of control over how you're bringing your product or career to fruition. It depends on what is your focus and interest, musician or businessmen? I think it’s important for musicians to focus on what they do best and make sure that they are really good at their craft — it’s good to develop business acumen but not all are born with that gift or interest, so we always need to go back to fundamentals, i.e. music. Music, ultimately, when put out into the world for sale, becomes a product. Whether or not it fares well more often than not boils down to a mix of good luck and good marketing — an acute understanding of the landscape, target audience, and how to best entice said audience to be inclined towards consuming the product. The better a musician's understanding of the business side of the industry, the wider his perspective, and the better he can find his or her own unique place in it. Depending on the kind of music they are playing, it is important to tailor a sound strategy to make sure that the good music reaches the right target audience. Many of times, musicians have a very good end-product to offer, but the lack of an appropriate approach to creating public awareness is sometimes the limiting factor preventing the music from realizing its full potential. The better a musician's understanding of the business side of the industry, the wider his perspective, and the better he can find his or her own unique place in it.​"
To what extent do you see the business side of music complimenting artistry? They're not inherently mutually exclusive. However an artist chooses to handle his/her career is up to them, but there's never one way to do anything. Anyone who claims to have an absolute solution for how anything should be done is dangerous and is usually wrong, in my experience. I think it would be the part where you need to understand the market and be able to write good music that can be well liked by most of the fans. Here I am talking about the sense for marketability of music. In today's digital age, where it is now easier than ever before for budding musicians to share their music with the world, we see the online sphere teeming with an abundance of fresh and exciting music content. While this is good news for music lovers, it also means that there is more competition than ever for musicians, especially new ones. Good marketing hence is crucial in preventing a piece of music from being buried under the sheer volume of available music content, ensuring that it reaches more ears, more places, and lasts longer at the forefront of music discovery. Without a doubt, the music has to always be the foundation of everything. It is, therefore, essential to focus on the craft itself before working on the marketing aspect of it. To me, it really depends on the kind of music that is being created. There are forms of music that belong to a more targeted and niche market, while there are some that are more suitable for public consumption. Understanding your music and identity first sets the direction of where everything should go. Integrating a business-focused mindset will also help the musicians to understand the target audience better, so as to customize the right approach in terms of brand development and promotion. So it's always helpful to have a market-focused approach after deciding on your direction. Anyone who claims to have an absolute solution for how anything should be done is dangerous and is usually wrong, in my experience." What would you look for in an ideal "pitch" by a new band? Apart from great music, a long term plan is always valuable, even if it's a loose plan. The core element in recorded music industry is A&R, artist & repertoire — in other words, solid talents with good songs/music. Something fresh, something exciting, something that moves me. I'm really looking for new ideas and concepts that will create more dimensions in what we already have today. The beautiful thing about music is that it can be applicable to so many different facets of life, and it is really up to the creativity of the musicians to come out with something out of the norm, and realistic at the same time! I think it’s important for musicians to focus on what they do best and make sure that they are really good at their craft." In the next 5 years, how do you think the music industry will continue to evolve? Distribution is very democratised now — creators are becoming more business savvy and are more aware of the options available to them, and gatekeepers matter a little less now. Also, the fact now that many bands now market and tour to a global audience (Bruised Willies, Forests, Caufield Cult, Fauxe, Slowdown, Yllis, etc etc etc x infinity) means that there is so much room for development down the road. The template is changing quickly and it's quickly emerging that there is no template, only malleable options. Music is part of a lifestyle, it will always evolve and change. The digital revolution (Internet) has changed recorded music's business model completely and the change has yet to be finalised. If we are talking about music itself, it will always evolve and the key here is sustainability. The music industry's growth and evolution is tightly intertwined with the advancement of technology, and hence it is difficult to predict exactly how it will evolve in five years. However, based on current trends of music consumption, we can definitely expect music discovery to continue and complete its shift to predominantly take place on music streaming services — for the average man on the street to be decreasingly concerned about permanently owning a piece of music as compared to having the access to discovering and listening to it, and for musicians across the world to keep pushing boundaries and challenge the traditional album format (i.e. Beyonce's visual album Lemonade, Matoma's dynamic album Hakuna Matoma). It is a very exciting time for music, indeed. I am really looking at a stronger overall infrastructure in the next 5 years. The scene will not only be filled with talented musicians, but also an incredible core of artist managers, independent labels, production crew which will help the industry take another step higher than what we have now. While a lot of focus has been placed on the amazing musicians we have on our shores recently, I believe very strongly that the other parts of the eco-system need to develop themselves to create a more robust industry, and to expand the current potential today. Having a stronger core will also enable our musicians to start extending their reach to a global audience. Applications for *SCAPE Invasion's Fireside Pitch are still open through here.